The professional network for the venture and crypto industries - Startup.Network arranged one of the most important business events of 2018 year - investment Startup Battles. Organisers together with the selected startups teams visited Boston, New York, San Francisco, Los Angeles from October 23rd till November 1st. Eleven promising and investment attractive startups from different countries, which passed through the strict selection were presented at the international Startup Battles. The Profiles of the attending Startups can be found at the event page. Delfast – Electric Bike Company has the aim to become the “Tesla” among motorcycles. Delfast's bikes are the current Guinness World Record holders for the longest distance travelled on a single charge: 367 km (228 miles). Younk Industries, LLC is the first blockchain-based community music record label where artists can get noticed and supported directly by the community. Its mission is to modernize the music industry and to help artists be heard. The community gets involved in the funding of up-and-coming hits in exchange for master rights of produced tracks. Younk has already raised US$2.5 million in equity funding from private investors. The Younk platform is available at: www.younk.com. Protect-My-Bike mission is to completely eliminate the annoying problem of stolen bicycles. Integrated approach: location tracker of new generation (battery lifetime of over 7-8 years, fixed in frame, low cost) and cooperation with police. It can be called: "LoJack for bicycles". Propzie - all-in-one solution for fully automating short-term rental management, including real estate and channel management and a subscription-based service provider marketplace. SECURIX.IO is a blockchain technology company specialising in mining cryptocurrency with a highly scalable mining location in the Netherlands. Through our asset-backed SRXIO token, Securix is lowering the barriers to entry for cryptocurrency investors - while helping token holders earn passive income through an innovative monthly gross revenue sharing business model. Satoshi Nakamoto Republic. The main goal of Satoshi Nakamoto Republic’s mission is to create virtual cities using the Augmented Reality technology and unite them into the Virtual Republic. FinCloud. Synergy of classical banking and innovative tools, designed to support the global movement of capital in the digital area. We combine the reliability and rules of the conservative banking world with the speed, convenience and transparency of the blockchain solutions in the mobile operator's shell. EcoVerseGlobal is the first ever self-sustainable platform using AI-DPOC. (Artificial Intelligence supported Delegated Proof of Contribution). EcoVerse solves daily usability and universal adoption issues by improving transaction times, security, and interconnectivity - the goal of hundreds of thousands of real users. TuSion is a platform that helps to improve employees productivity and work satisfaction. Gaming sessions combined with neurofeedback can increase the ability of relaxation or concentration, boost stress resistance, get rid of bad habits and improve the mood. VideoCV.io - allows hiring managers to quickly get in touch with job candidates, getting an intimate and realistic idea of the person you are looking to hire through the video based platform. Employers can spend less time on the interviewing process by utilizing our technology, helping your organization to recruit the best team members. Raccoon.World - gadgets for hands. Help to promptly return people with hand physical disabilities to fulfilling life through the creation of technological and affordable rehabilitation solutions. In total 70+ VCs, Crypto investors and Angels attended the Startup Battles in 4 cities as Judges. “Seasoned investors know that to get a leg up in any industry you have to be in the room with founders when they first come up with the revolutionary product/idea. Since this is almost impossible in most cases, the next best thing is being in the room where the founders pitch their ideas for funding. Startup Battle offers this opportunity and takes it up a notch by "whitelisting" entrepreneurs with a solid track record, business model, and product thus saving investors precious time. Startup Battle also features speaking panels with top people in their field discussing topics that are relevant to the current economic ecosystem. The discussions are engaging, and all the participants have unique insight into the conversation. And let's not forget, an essential part is the "dinner/drinks/party" portion of the event where investors and entrepreneurs get the opportunity to discuss further ways of working together and more often than not striking a deal over a glass of wine”, - said Chief Solutions Officer at Beyond Enterprizes Adrian Cazan. As usual Startup Battles were held in two stages: Panel Discussions and Startup Pitches. In each city, there were very relevant Discussions for entrepreneurs and our guests on the following topic: “Crypto vs VC: The Latest Trends and Predictions”. In Boston: VC at Glasswing Ventures - André Rocha; General Partner at Mendoza Ventures - Adrian Mendoza; CEO of GSVLabs Boston - Seth Hauben; Moderator: Managing Partner at One Way Ventures - Eveline Buchatskiy. In New York: CIO & Portfolio Manager for Myriad Capital - Nathan Carpenter; Venture Partner Starta Ventures - Evan Madden-Peister; Partner, Crypto Global Capital, LP - Stephen Drew; Moderator: Award-winning journalist, editor and entrepreneur, and an early crypto adopter - Jeff Koyen. In San Francisco: Advisor at Block Bits Capital - Jared Barol; San Francisco Launchpad Manager at ICX Station - Daeki Lee; Partner at Norwest Venture Partners - Scott Beechuk; General Manager of Fenox China - Sophie Yao; Moderator: Serial entrepreneur, Inventor and an active Angel Investor - Dmitriy (Jim) Kolchin. In Los Angeles: CEO and Founder of IPA Equities is a global investment firm - Keith Herman; Entrepreneur, Cryptocurrency Expert, Public Speaker, Mentor, and Digital Marketing consultant - Jesse Mauck; Managing Partner at Nordic Eye Venture Capital - Richard Sussman; Innovation Executive (Cloud+Kubernetes+AI+Blockchain) @IBM - Pavel G Ferreri; Moderator: Partner at Greenberg, Whitcombe, Takeuchi, Gibson & Grayver, LLP - Leonard Grayver. We hope that it was great international experience for all participants who received useful feedback from world-class leading Investors, got acquainted with representatives of the local Venture and Crypto Funds, and some were luck to be invited for a meeting for negotiating the terms of cooperation. Startup.Network also would like to express its gratitude the partners of the event for helping with the organizational aspects. 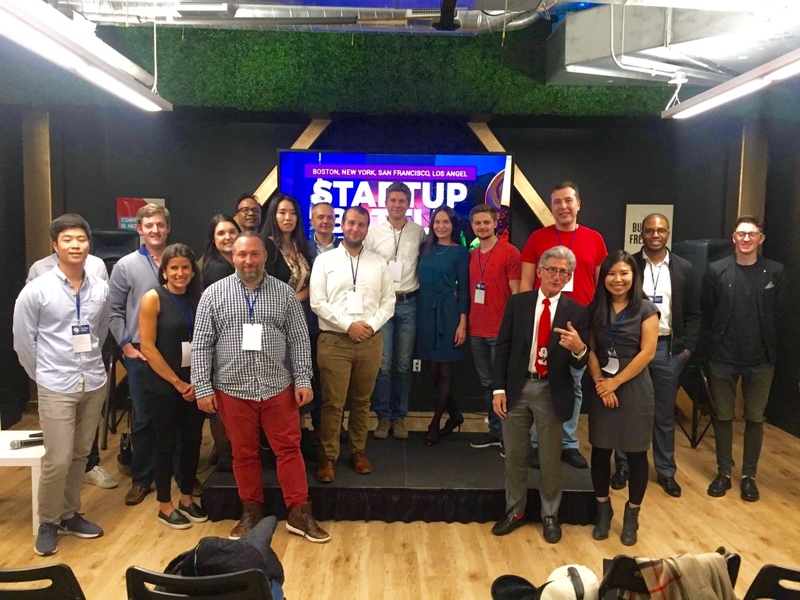 Evelin Buchatsky and GCV LABS in Boston; Starta Ventures in New York; 500 Startups - in San Francisco, Leonard Grayver in Los Angeles, and all participating Judges. If you did not get a chance to attend our event but you are still interested in launching your startup on the American market, get useful advice from international experts on how to develop your startup on the global market, attract attention of the world-class Accelerators and Venture Funds, follow our announcements here. Seize your chance to pitch at the next Startup Battles. We are always happy to welcome investors, experts, guests at our events all over the world.